A full bodied tobacco without any floral or perfume notes, this E-Liquid is nutty and just sweet enough to take off the bitter edge. Triple Nickel is Apollo’s version of the nutty 555 cigarettes. A full bodied tobacco without any floral or perfume notes, this E-Liquid is nutty and just sweet enough to take off the bitter edge. A wonderful flavor for those craving a tobacco cigarette. When we put this one out for testing, it came back with almost a perfect score. We love it and we’re sure you will too! Like the flavor, but prefer a bit more straight tobacco taste. It's good and just depends on whether you're wanting a more tobacco taste or a nuttier sweeter flavor. Meets my nicotine and flavor needs best since running out of my all time favorite from V2. I mix with menthol to make it more “fresh “. This has been moved to my second favorite now that I have tried Cherry al a mode. Both are smooth and pleasing vaps. One of my many favorite apollo flavors. The tobacco has a sweet hazelnut taste to it which reminds me a little bit of hazelnut coffee. The flavor was done great and I will continue to purchase bottles for myself and my family. Different take on a tobacco flavor which is something that I like to see. Sometimes when flavors are only slightly different they start to taste the same. This one is different and is not like other tobaccos that I have tried. It is very good. The triple nickel flavor is one of my favorites. It is sweet and has a good nutty taste to it. I think it is hazelnut tobacco flavor. I like mixing it with the Simple Tobacco too. I've been doing that for a while now and have not gotten tired of either of them. I like doing the 24mg and don't find it harsh at all. This flavor is great all around. I never get tired of it and always order this one. It has tobacco and a nutty taste as well. So it is a sweet tobacco flavor. Sometimes i get tired of tobacco flavors because they don't have any other elements to them. But because of the nutty flavor it really adds to this one and makes it very enjoyable. I really love this tobacco flavor because it's sweet and the hazelnut gives it a taste that I have never had before. If you like hazelnuts you will love this because it's not like a tobacco flavor that I have tried before. Oddly I like mixing it with the Banana Cream. It really tastes great together! What can be said about this flavor that hasn't already been said? This is AMAZING!! A calm tobacco with just a hint of nuttiness that isn't overwhelming. I'm not big on sweet flavors, but the little bit you get from this is just enough to calm the nerves for a tobacco fix and not make you feel like you have been licking an ashtray. Perfect balance!! I want to buy it by the gallon! After trying other flavors this is now my permanent favorite. It has a slightly nutty taste to it. Not over powering just a pinch. I do not know where to begin talking about this flavor I love it I love it I love it. I have gone nicotine-free and I am thankful for this juice being there. I even bought one with nicotine for a friend to try. I tried that juice and I had to get it out of my hands because if someone is still wanting nicotine and smoked this and wanted just a little sweeter tobacco taste this is the one. You need go no further you might as well just go ahead and purchase this and call it a day. the hazelnut aroma is interesting, but it can be a bit too much when having this all day. this was a gift. I'm told it is smooth full flavoured with a soft nutty edge/after taste. They love it. Nice tobacco & nut flavour, needs a bit of steeping to really shine. I was never such a big fan of tobacco flavours, but got the chance to try this in my best friend’s ecig and been vaping it since!!! I simply cannot imagine myself vaping anything else as this is by far the most delicious e-liquid I have tried. Highly recommend this to everyone. This is about as close to smoking a strawberry as you can get. It doesn't taste like candy, strawberry flavoring, etc. It tastes very close to a real strawberry. I did take one star off because the flavor is weaker than it should be. 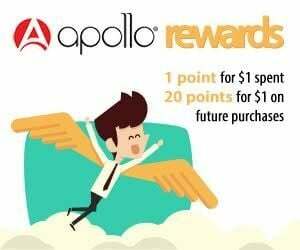 Apollo needs to offer double and triple shots. I also noticed the coil went much faster than I am used to. I usually go through 2 30ml bottles before having to replace it, and I only made it through a half of 1 bottle of this before replacing it. This is my 1st order from Apollo, and I usually order high VG though. Not quite sure how to explain the "taste" of this one.. but I do know I really love it! It is very smooth but with a decent throat kick without being scratchy/irritating in any way. There is a very mild couple of spices I can't put my finger on but they just work. There is no lingering aftertaste on the palate, nor any offensive vapour odour. Maybe, "pleasant" is the overall word I am looking for. I doubt anyone could "dislike" this flavour. It also mixes really well with flavoured juices to make a flavoured tobacco. For example, i put 50 drops of this and 50 of apple pie juice into an empty bottle, shook well, steeped a couple of days, and the result was delicious. it was like having a cigarette, but without any of that horrible combustion taste, with a great smooth throat hit, and a sweet apple exhale. I recommend this, and I also recommend flavour experimentation with it. Enjoy! It's has a relaxing hazelnut flavor with the perfect tobacco blend. The throat hit is just above average to were it not to over powering and off putting. Overall this ranks as a perfect choice of the tobacco flavor catagory.